There are well over 100 reliable kashrut certification agencies in America alone, and many others worldwide. Each has its own hechsher, or kosher certification symbol, that serves as a kosher stamp of approval for countless products. That's a boon for kosher consumers, but some find staying on top of the sheer array of unique hechshers daunting. Why? Some Jewish communities are more stringent than others regarding kosher standards, and question the validity of certifications that others readily accept. Some ill-informed or unscrupulous manufacturers add their own kosher marks to packaging on products that in fact have no kosher supervision. Some hechshers are considered controversial, others invalid. Though far from exhaustive, here's a evolving list of the major players on America's regional kosher certification scene. The agencies below are widely regarded as reliable, and most supervise products that are available in several states, if not nationwide. The Atlanta Kashruth Commission's Georgia peach kosher logo isn't the most common of hechshers -- the agency certifies more industrial than consumer products, as well as Atlanta area hotels, restaurants, caterers, and supermarkets. Still, the AKC's seal of approval is a notable one, as it appears on hard-to-find kosher ingredients, like artisan crafted miso and umeboshi vinegar. Though it's a regional kashrut supervision agency, many would argue that the Chicago Rabbinical Council's scope and influence ranks with with world's top 4 kosher agencies. The CRC's website is fairly comprehensive in terms of consumer-geared information; resources run the gamut from an article on which Starbucks beverages and Slurpee flavors are kosher, to guides on Kosher for Passover products. New Jersey-based EarthKosher is unusual among kashrut agencies in that it has an express commitment to aiding small and mid-sized companies -- both in the US and internationally -- that wish to obtain kosher certification. Aside from touting its affordable, transparent pricing structure, EarthKosher prides itself on providing expedient, yet thorough certification. EarthKosher's most visible clients skew toward natural and organic producers; the agency also offers a joint Vegan Verification program as an adjunct for kosher certified products that meet this additional standard. Los Angeles based Kehilla Kosher, often referred to as the "Heart K," is found on several prominent natural foods brands, perhaps by dint of the certifier's geographic location and the local market for natural and organic products. Interestingly, (and perhaps confusingly) the Kehilla Kosher, also known as Igud Hakashrus of Los Angeles, utilizes more than one kosher symbol. In addition to the "Heart K," there is also a hechsher that resembles a narrow serif "C" surrounding a "K" (shown in the photo at left). Bob's Red Mill products are marked with a bold underlined "K," a holdover from an earlier certification. Los Angeles-based KSA is the largest kosher supervisor in the Western United States, and certifies several companies in China as well. Many of the companies for which KSA provides kosher supervision fall into the natural/organic food and gourmet specialty food categories. In addition to food products, KSA provides kashrut oversight for hotels, restaurants, caterers, supermarkets, and food co-packers, among others. Spring Valley, New York's Natural Food Certifiers describes itself as "the only international organization that provides certification to 5 natural food standards including kosher." 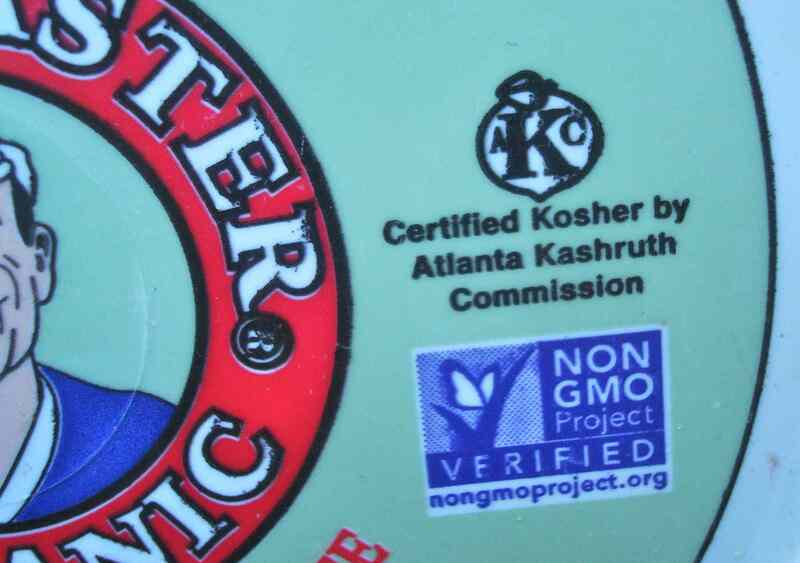 The Apple K's "Kosher Natural" designation was first established in 1997, and is unique in that it "only certifies foods are organic and GMO-free." Savvy foodies know that between wine and artisan food production and an innovative restaurant scene, Oregon is hotbed of culinary excitement. Oregon Kosher makes a bit of the Pacific Northwestern bounty accessible to the kosher market, with its certification of several local producers, including a winery and smokehouse. The symbol of the Vaad Hakashrus of Denver resembles an open Torah scroll with a K inside. As an interesting side note, one of the Denver Vaad's unique specializations is kosher certification for correctional facilities. The Scroll K also handles certification of food hauling trucks and railcars, and trailer washing outfits. Given that the Baltimore-based Star-K is consistently ranked among the top kashrut agencies in the United States, if not the world, it's a little strange to call it a regional certifier. But in addition to its international reach, the Star-K has tremendous influence on its home turf, certifying local restaurants, hotels, caterers, ballpark concessions, supermarkets, college campuses and hospitals. That sort of local specialization is of course common among smaller certifiers nationwide. But given the Star-K's sheer size and worldwide scope, it's telling that to Baltimore-area consumers, the agency remains a major shaper of local Jewish life.